"Revolutionary corana discharge principle to create sound from the air"is how these very unusual and extremely rare pair of Ionofare Model 603 full range loudspeakers are described. Manufactured circa 1960 they still may be unequalled. 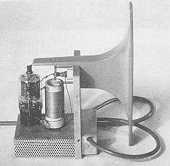 Developed by Seigfried Klein of Paris in 1946 and work by ionising air particles under the influence of an electric field.Ahead of its time the heart of this three way system is Inofone Ionic 601 high_frequency unit that has a frequency range of 3kHz to over 50kHz.+_ 2dB.The 601 HF unit comprises two parts; power supply and horn connected via cable.Audio frequencies are created by modulating a 27MHz signal that ionizes the air contained in a quartz cell strategical placed at the throat of a highly efficient expotential horn. The resault, because there is no diaphram, no moving parts there is a an amazing uniform response beyond 50kHz.